■Differential pressure gauge can be installed as option! 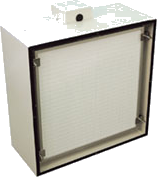 ■Replaceable HEPA filter after installation in the clean booth! ■Stainless steel plate is also available! * Stainless steel plate is also available.